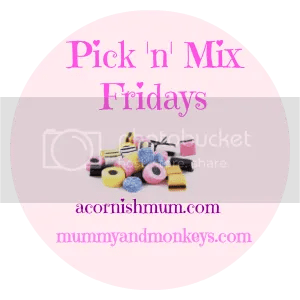 Hi and welcome to our first Pick ‘n’ Mix Fridays. A brand new blog link up with me and the lovely Stevie over at A Cornish Mum. One of mine and Stevie’s favourite things as a child was a 10p pick ‘n’ mix bag of sweets on a Friday after School (as long as it contained fizzy cola bottles) which is how the name and day for the linky was born. We welcome you to link your posts on any topic, the more variety the better. Our rules are simple and any questions please ask, we are both very nice! You must grab our badge which can be found here or on Stevie’s site. Simply copy the code from the box below and add it to the text/html at the bottom of your post. If you plan to be a regular linker feel free to add it to your blog side bar. Please comment on both host posts and as many others as you have the time for. When you comment if you include #PicknMix then they will know that you have a post or posts linked up yourself and are more likely to return the favour. "10 Things I have liked/loved this month June"
Thanks for the invite and for hosting !